We can continue changing the format to our table to make the information more appealing. 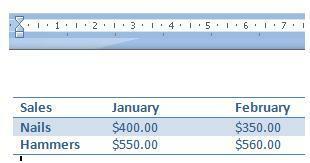 This function is commonly used in Word to present quantities or structured information in documents. 2. Click on the Centre in our toolbar under the Home tab. 3. ANother way to do this is to click on the right button in your mouse, this will open a window with options. 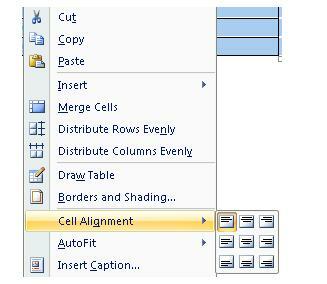 Locate the Cell Alignment function. This will present the options graphically. We selected the Centre option. 5. Click and hold the left button in your mouse over the column marker (over the ruler) and move to the left to reduce the size of the column. You will see how its size changes as you move your mouse. Once you reach the size you want, release the button in your mouse. 8. 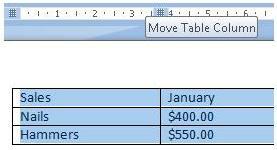 This is the way our table looks after reducing the size of the columns and changing the format. We can use any style or size depending on our needs.